Painted furniture is all the rage. You know it. I know it. Every person deciding if they should buy new or re-paint!! The blogging world knows it. Pinterest knows it. Every thrift store knows it which is why they have raised their prices. Repurposing and repainting is in!!!!! Painting furniture! What is it worth to you? 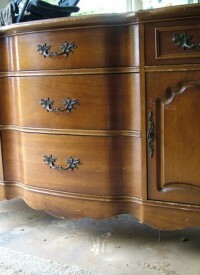 This is the easiest way to look at furniture and its restoration. The first question we ask about a piece of furniture is some sort of history. At Blue Line Studios, more than 60% of the furniture restoration inquiries we get is, “there’s little value to it” and the customer wants to “spruce” it up. It would be hard to invest $1,200 dollars into something that was purchased for $25.00. Designers are great visionaries when it comes to this. We have had items shipped from NY to be painted or refinished and would say the cost of painting some of these pieces has been in the thousands. To a designer this really does not matter as much as it does to the client. I like to explain this to customers this way: It’s like buying a suit at a high end men’s store. You purchase a suit for $700-$2,000 and buy a tie for $100.00; that would be acceptable compared to the price of the suit. Purchasing a tie, alone, for $100 is not a purchase you may normally make! The same goes with furniture. If it is a yard sale piece and does not have sentimental value, then it may not be worth shipping it to have it refinished for $1,200-$2,500, but if it’s a piece that has been in your family for many years or a piece that you purchased that has special value to you, then it is probably worth spending the money to have it beautifully refinished! 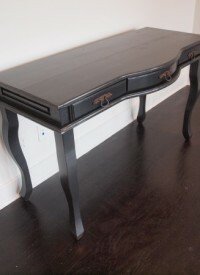 Some of the techniques used on furniture are: Strie’ or drags, age and distressing, architectural additions, antique and staining, Art work, gold/silver leaf, epoxy laminates and straight paint.